On Sunday, if you are the Red Devils manager, you are going to be frustrated with the way the game is going, but it was a massive over-reaction and he must have known he would be sent off. 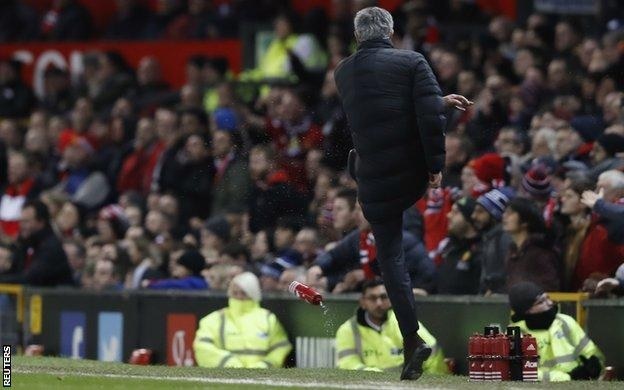 It is not the first time Mourinho has lost his temper this season - it is linked to what is happening in front of him. Sir Alex Ferguson, David Moyes or Louis van Gaal would all have been the same as Mourinho - all pretty annoyed. It just comes down to how you show it. Mourinho certainly didn't hide his feelings. I think whoever is putting those bottles in the United technical area should find somewhere else to keep them, because he is only going to keep kicking them if he is angry. He needs to keep a lid on things because the hierarchy at United will not be happy with the way he is behaving.